Lying near to Alsterdorf, Fuhlsbüttel, Gross Borstel, Niendorf and Ohlsdorf, Hamburg International Airport (HAM) is to be found just 8 km / 5 miles north of Hamburg city centre. The airport's annual passenger statistic have never been more impressive, approaching 13 million annually, with approximately 170,000 airline movements. In total, there are around 70 different airlines currently based at Hamburg International Airport, flying to 120 destinations, both international and domestic. Passengers and visitors alike will enjoy a visit to one of the three observation areas, where views of the aircraft are a major attraction. Also of interest at Hamburg Airport is a highly detailed scale model of the entire complex (1 to 500), which was originally built in 1956 for the two World Expositions of that year and has recently been updated, coming complete with runways and around 5,000 tiny lights. Although Hamburg Airport does not yet feature direct rail access, the nearby Ohlsdorf Station is just ten minutes away and connected by regular 'Airport Express' buses. Numerous shuttles and taxis run between the airport and central Hamburg, next to the River Elbe, also linking the bustling Altona district, the waterfront area around the harbour, the red-light district of St. Pauli and the upscale Eppendorf neighbourhood. 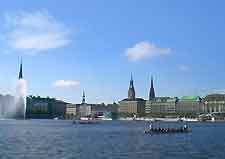 Otherwise known as Old Town Hamburg, the historic Altstadt area is also easy to reach from the airport, along with the nearby cities of Norderstedt and Stade. Hamburg is Germany's second-largest city after Berlin and home to a significant port, which is amongst the biggest in the whole of Europe. When visiting Hamburg, lookout for the TV Tower, Hagenbeck Zoo, Japanese Gardens in the 'Planten un Blomen', the Panoptikum (Wax Museum), the Planetarium, Alster Lake, and the lively Sunday morning Fischmarkt, which takes place along the banks of the River Elbe. Many further attractions surround Hamburg Airport (HAM) and can be found within neighbouring German towns and cities, such as Altes Land, Luneburg Heath, Norderstedt and Stade, a historic city known for its strong Swedish character and imposing Church of Saints Cosmas and Daniani.